Zimbabwe’s decision to scrap a peg between its quasi-currency bond notes and the US dollar brings a welcome end to a failing monetary policy, but it is not the solution to a deeper crisis, economists said on Thursday. 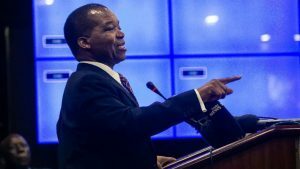 The Reserve Bank of Zimbabwe (RBZ) on Wednesday said it would carry out a “managed float” of the surrogate bond notes and electronic dollars, effectively creating a national currency for the first time since adopting the US dollar in 2009. The bond notes and electronic dollars will be known as a separate currency called RTGS dollars. Banks were closed for a public holiday on Thursday. Street traders said there had yet to be any change on the black market, where one US dollar still costs around 3.5 bond notes and $4 in electronic funds. “I think if the RBZ manages to keep liquidity low the rate will definitely stabilise,” one trader said. Due to a desperate lack of hard currency, the bond notes and notional dollars in the electronic banking system have been steadily dropping in value on the street, worsening the hardships of ordinary Zimbabweans as inflation soared. A more realistic approach will be welcomed by investors and foreign donors but it will not reverse the currency crisis, experts said. The RBZ only has enough foreign exchange for two weeks of imports. “The fact that officials finally came to their senses and ditched the notion that Zimbabwe’s quasi currency was at par with the US dollar, is comforting,” said Jee-A Van Der Linde,analyst at NKC African Economics. This will only work if the central bank can access foreign exchange on international markets, which it says it has secured. Many Zimbabweans have their doubts. “What they have done is to reintroduce the Zimbabwe dollar without the name. We have seen this before, it will lose value very soon,” said James Mawire, a manager at a firm that sells mining equipment. Though the RBZ said it had accessed sufficient lines of credit to buttress the exchange market, it provided few details. “There are many questions that remain unanswered,” said Tony Hawkins, professor of business studies at University of Zimbabwe. The post Zimbabwe’s currency reality check puts plaster on deep wound appeared first on SABC News – Breaking news, special reports, world, business, sport coverage of all South African current events. Africa's news leader..